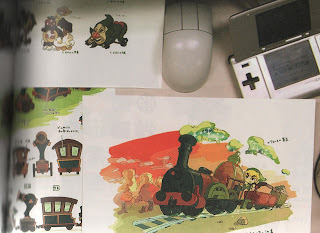 Someone over on 2ch posted a slew of photos this morning that seem to have been taken from pamphlets Nintendo of Japan uses to attract employees. 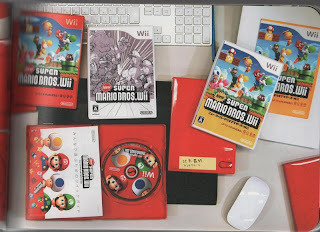 All of them are worth checking out, but the alternate New Super Mario Bros. Wii box art--featuring Bowser and the Koopalings/Koopa Kids--in the photo below takes the cake, in my humble opinion. Of course, the "Tingle tank" that can be seen in the upper left-hand corner of the following photo is pretty damn cool, too. Links to more such photos can be found here and here and here and here. Or, just scroll through this NeoGAF thread. OMG. TINGLE TANK?! It's the gayest thing in Hyrule. :-P I love it! I know! How could they *not* put that in the game?!? We got the red one in Germany. I think the red box is kinda funny because it's an eyecatcher between all the white wii-games.